Home » Blog posts · Food Facts and Trends » Sprouted Grain Breads: Are They Healthier? These days, sprouted grain breads are sprouting up all over grocery store shelves (literally). 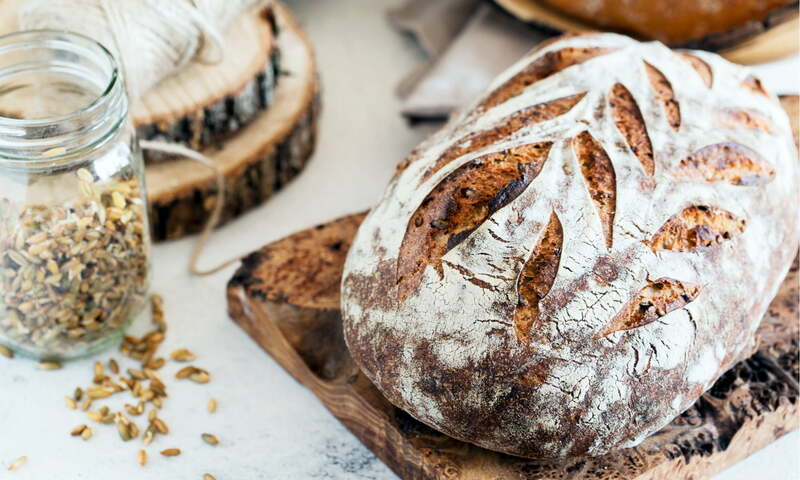 While non-sprouted grain breads still have their places, sprouted grain breads are slowly but surely establishing their footholds. So what’s the big deal? While more research needs to be done on the exact health benefits of sprouted grain bread, some studies show that sprouting (or germination) can increase phytochemical content, vitamin C content, and antioxidant activity. So basically, sprouting can “unlock” nutrients and can improve the bioavailability of certain vitamins and minerals. Remove phytic acid. This means that while various breads may say “10 mg of magnesium”, this magnesium is bound up in phytic acid and your body can’t actually absorb it. Sprouting removes the phytic acid and makes nutrients more available, so 10 mg of magnesium actually means 10 mg of magnesium. Be easier to digest. Many people avoid gluten because of its effects on digestive systems. With sprouted grain breads, gluten can become more easily digestible because sprouting helps predigest the gluten. Obviously, this doesn’t help a celiac (there is still gluten! ), but if gluten gives you a little trouble, test out sprouted grains. Increase fibre content. Many studies show that when various seeds are sprouted, their fibre content increases. It also becomes more available! Sprouted grain breads aren’t just for the health conscious, they can also make you feel great! In comparison to non-sprouted grain bread, they have lower glycemic levels, which means that your blood sugar is more steady and can power you through the hardest task of all: work. They also won’t leave you with brain fog, unlike other high-starch foods. (While high-starch foods taste like a dream, let’s be real: sometimes they make you feel like crap.) Steady energy and no brain fog sounds good to me. Don’t worry, sprouted grain breads don’t taste like bird food as some might think. They’re still fluffy and dense like “regular” breads, and can even be a bit sweeter because of the extra soak time! We love them. And in all honesty, birds probably would too. So, in short, sprouted grain breads aren’t just for the health benefits. They also taste great, and we really like ‘em because of the way they make us feel (cue Michael Jackson). Have you tried them? If so, let us know. How do they make YOU feel? Find sprouted grain breads at any of our markets or at SPUD.ca. previous post: Enter Our Kids Colouring Contest!